"Hey Dave - Why are you so KICKASS?!?" "Hey Dave - Which audio interface would you suggest between model X and model Y?" This is always a tough one for me to answer because sometimes I've used them both, but often I've only personally used one or the other. As a result I can't make a fair comparison. So because everyone enjoys a good countdown list, I've compiled my own top list of USB Audio Interfaces under $300. Click the link or the picture for each entry to head over to Amazon.com and add that interface to your setup! Every interface on this list has at least 48 kHz sampling rate, 24-bit depth, and USB 2.0 on board standard. Obviously, based on the title, they are also less than $300 retail (but many of them can be had for less than $200). So the above specifications are a baseline and simply get you into the conversation. To move up the list you have to score well on a separate set of requirements. Anyone who's made a countdown list like this knows that step 1 is to establish the criteria to base your decisions on. Otherwise, you end up losing focus and chasing your tail. The first one deals with what I consider to be any unique feature of a unit that separate it from its peers. We're talking about the best here so great sound, solid drivers, and smart layout are common to all, but anything in addition to that was considered first. Quality is defined as the overall durability and feel of the unit itself. Basically, units that are rugged, solidly built, and seem ready to rumble score points here. The third criteria refers to the Wow Factor or Sizzle. In other words, does this thing have any charisma or drawing power, or does it simply perform a function as a piece of gear. A cool looking unit on its own doesn't mean much, but if the rest of the package is in place, a strong aesthetic design can can push it up the ladder. Starting off with #4 is the US-366 from Tascam. With a ton of input / output options at your disposal, as well as digital mixer built in, this one caught my attention recently. Getting a chance to use it for myself, though, turned me into a fan. The controls on top are easy to access and setup was a breeze. It has a small form factor (so it can fit in small places), is lightweight, while still feeling sturdy and strong. Also, Tascam has a great reputation for consumer music products and their experience in this area shines through with this offering. If you get a chance to grab this one, do it with confidence because it has everything you need plus a few extras that are sure to put a smile on your face. The next spot on the countdown features a unit with a unique style that's all its own. The countdown continues with the Focusrite Scarlett 2i4. This interface has everything you need, but also complements the basics with a great look. With brushed aluminum and its signature scarlet color scheme, it is solid inside and out, from top to bottom. It also includes an attenuation pad on each channels input in case you are using a high output device, such as a digital keyboard. Add MIDI and a variety of monitoring options and this is a powerful combination for your home studio. Whenever someone asks about the 2i4 it's hard for me to not jump the gun and automatically give it my endorsement. In fact, as you'll soon see, there's only a few interfaces that can outpace it right now in my estimation. These next 2 interfaces are in rare company. The 22 VSL interface from PreSonus was one of the first interfaces I reviewed for the site. I thought it was great then, but I held out judgement until I had more units to compare it against. Now that I have, there is no doubt in my mind that it's one of the best options out there. Easy to setup, great sounding, tons of inputs/outputs, small form factor, powerful included software, beautiful looks, the list of pluses goes on and on. Add to that the latency reducing digital signal processing and other speedy hardware design features and this one almost had the firepower to take the crown. But for everything this one brought to the table - it didn't have that final push over the cliff. 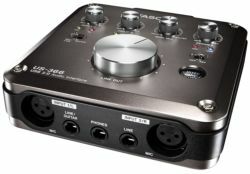 Taking home the crown in the countdown is the King of Kings, the Quad Capture Audio Interface from Roland. This beauty has all the basics down cold, but adds the ability to set your gain automatically with its Auto-Sense feature. And it needed the Auto-Sense in all its session simplifying glory to push it past the very capable PreSonus 22 VSL on my list, but the truth is that I love this feature. It doesn't hurt that its rock solid, has great controls, and exhibits the overall quality you'd expect from the high end of our price point. But like anything, you get what you pay for, and if you pay for this unit you will never regret it. The truth is that it's not even that much more than the rest. Take it from me - this unit is the real deal, and I promise that you'll see the Auto-Sense feature in the next generation of interfaces across the board. 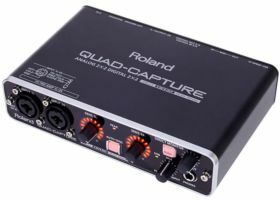 Until then, the Roland Quad Capture stands alone on the mountain peak. Pick one up when you're ready to take your home recording to the next level!